More than 90% of disease-related mutations are caused by ''microlesions'' [single-base substitutions or small insertion/deletions (indels)] rather than large lesions (such as rearrangements or large indels) (Human Gene Mutation Database). Given this overrepresentation of microlesions, it is paramount that mutation detection methods are sensitive to single-base substitutions. The principle of heteroduplex analysis relies on the formation of hetero-duplex species formed when there is a complementary sequence mismatch in a double-stranded DNA fragment. The electrophoretic mobility of a heteroduplex is altered relative to a homoduplex and in general tends to retard migration of the fragment. Clearly, if an alteration is homozygous no heteroduplex species will be formed and therefore it will be necessary to mix wild-type and mutant fragments together prior to the denaturation and annealing steps to generate four species: a wild-type homoduplex, a mutant homoduplex, and two heteroduplexes. 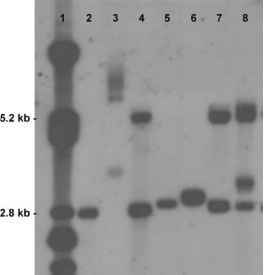 The occurrence of heteroduplex fragments was, in fact, first reported as a PCR artefact. Bhattacharyya and Lilley predicted the formation of two forms of heteroduplex depending on the type of underlying mutation. A small insertion or deletion produces a ''bulge'' as a result of a relatively large stretch of unmatched bases in the duplex (Fig. 1). Such ''bulges'' have been directly visualized on electron microscopy. In contrast, a ''bubble'' will form at the site of a base substitution. The net effect on migration of a ''bulge'' heteroduplex is much greater relative to a homoduplex, owing to the bending of the DNA at the site of the bulge. In fact, the larger the sequence mismatch, the greater the bend and, consequently, the greater is the degree of retardation. In contrast, the ''bubble''-type heteroduplex produces only subtle perturbations of structure, owing to less bending of the DNA and hence relatively minor migration defects. Nonetheless, the migration of these species can be further influenced by factors such as the length of fragment and even the nature and position of the mismatch.